A question that is starting to take shape as we begin replacing fishing boats in Samar and Leyte that were lost to Typhoon Yolanda (Haiyan) is — does it make more sense to replace the boats locally, with motorized bancas constructed locally in the traditional way, or replace them with fiberglass motorized bancas which, unless something changes, would be produced outside the storm zone and trucked in after completion. 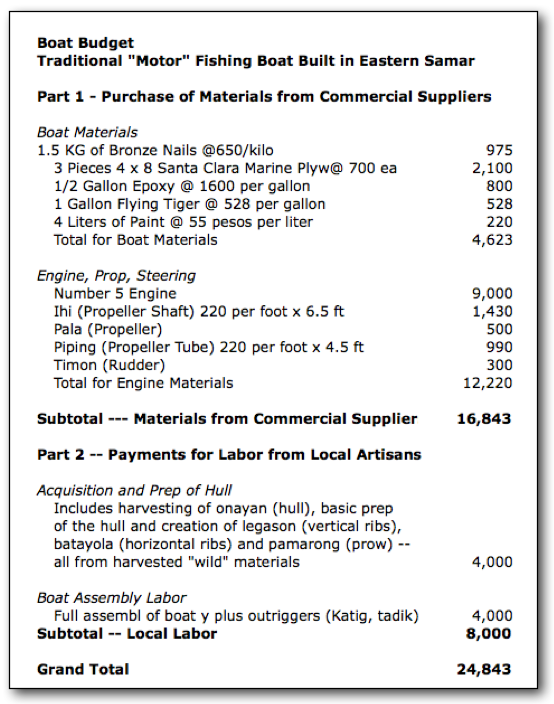 For the sake of discussion and analysis, let’s assume that the bottom line price is the same — P25,000 for either option — but the fiberglass boats would be built in Manila and delivered to Samar, while the wooden boats would be built locally in Samar. I have to admit that the idea of fiberglass bancas is intriguing. They are eco-friendly, they last longer — and going that route conforms to the “build back better” dictum which is mantra for best practices in post-disaster rehabilitation. But there is a counterargument that favors rebuilding the fleet traditionally on site in Samar. The question is this: Is the payment of P8,000 in local labor costs a big enough benefit to offset the benefits of fiberglass? How do we measure the benefit? First, there is the actual P8,000 paid. Artisan boat builder working on the onayan (hull) and legason (vertical rib) assemby of a traditional fishing boat. The second P4,000 goes to the artisan boat-builder who takes the onayan kit and all of the other boatbuilding materials and puts the boat together to completion. What do these two parties do with the money? Generally, they spend it in the community for food and other necessities, paying it to others who in turn also spend a portion of it in the community. In this way, so the theory goes, the P8,000 paid for local laboar actually has an economic impact within the community of somewhere between 16,000 and 24,000 pesos of economic activity/transfer that would have not happened otherwise. Does this additional economic benefit rise to the level of something that justifies going the traditional route, rather than fiberglass? The longer term option that seems attractive would be to create a local fiberglass boat-building capability in Samar. 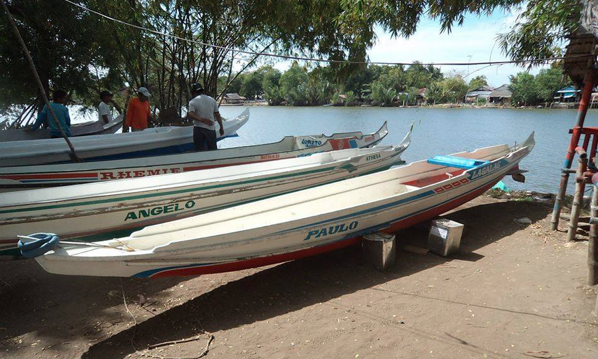 That would allow the best of both approaches — there would be local labor payments that would stimulate the local economy, plus the fishermen would get a fiberglass banca that lasts 15-20 years. From what I can tell based upon the reading that I’ve done and videos I’ve watched — the investment required to create a fiberglass boat building capability in Samar would be quite small, and the market is apparently quite huge. How much, exactly? I don’t know yet but I’m looking into it. Stay tuned …. ( and I welcome troubleshooting/debugging of the arguments either here or on Facebook).